Weezer fan convinced band to cover Toto's "Africa"
Weezer revealed their cover of Toto's 1982 hit "Africa" on Tuesday. 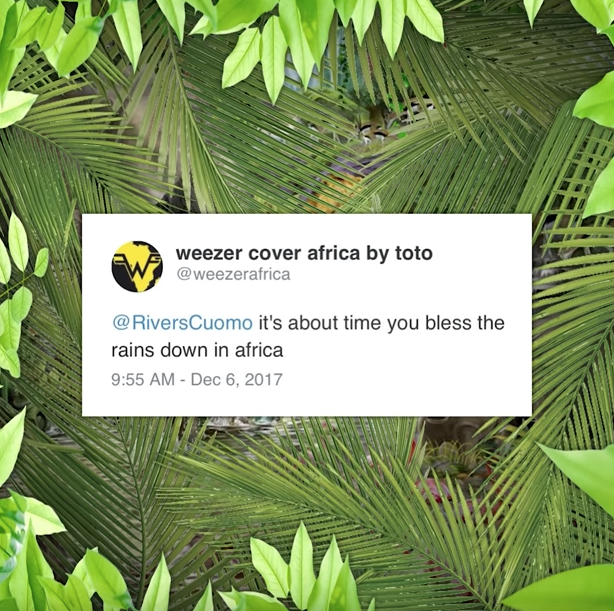 It was a matter of "giving the fans what they want," as the Weezer fan Twitter account @weezerafrica began suggesting the band "bless the rains down in africa" late last year. In early December, Noisey reported that a 14-year-old Cleveland girl named Mary, "who has been learning Weezer songs in her School of Rock cover band," was behind the account.